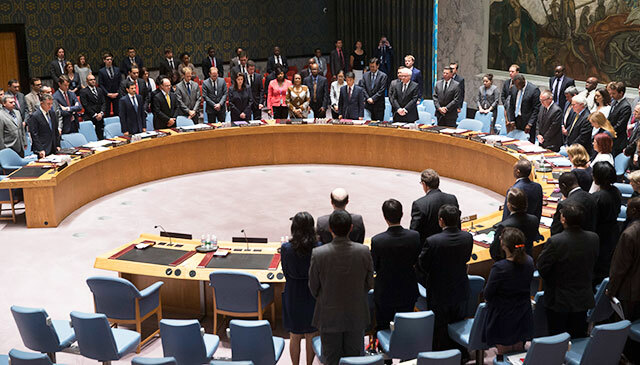 Russia’s veto of the recent United Nations Security Council (UNSC) resolution regarding the Malaysia Airlines MH17 disaster over Ukraine a year ago has garnered immediate condemnation across the West.Predictably, Russia has been decried as obstructing justice with language intentionally used to further heap guilt upon Moscow… which might perhaps be why Moscow itself had no faith in a UNSC resolution regarding MH17 to begin with. In the wake of the veto, the BBC would report condemnation from the US to Europe to Australia, a familiar trifecta of allied special interests overtly arrayed against Moscow and predictably using the MH17 disaster now for over a year to advance their agenda against Russia. Australia’s Foreign Minister Julia Bishop vowed to pursue “an alternative prosecution mechanism” with Malaysia, the Netherlands, Ukraine and Belgium, but stopped short of elaborating. It should be noted that Ukraine still stands as a possible suspect in the disaster, while Malaysia was originally excluded from initial investigations until after much protest, despite the doomed aircraft being registered in and operating from Malaysia. The United States and Europe had from the beginning used the disaster politically, openly accusing Russia and anti-regime rebels in eastern Ukraine before any evidence surfaced and before any investigation was underway. With such an immediate, reckless abandonment of objectivity, how could any investigative body including such politically-motivated actors proceed with any credibility? These are answers the Western media refuses to answer. Russia, with its veto, answers clearly. Such objective investigations are not possible. And while Russia disclosed the summation of its data regarding the MH17 disaster in the immediate aftermath, to this day information allegedly possessed by NATO members remains undisclosed. To prove just how disingenuous the latest UNSC resolution was, readers may notice how each and every Western news report covering the recent Russian veto includes a shameless, unsubstantiated repeat of the propaganda used since MH17 first fell from the sky, to implicate Russia and rebels fighting in eastern Ukraine. A diagram of a missile shredding MH17’s fuselage sits at the bottom of the BBC’s article regarding the Russian veto. Also toward the bottom, where the BBC hopes its readers don’t notice, is mention that Russia did indeed call for an international investigation, but simply opposed the current UNSC resolution and the tribunal it called for. Regardless of what Russia does, however, the irrational, politically-motivated nature of the MH17 disaster means that no conclusion except for Russia’s guilt will be accepted by the West. Trials, tribunals, and even investigations with predetermined conclusions may be called “justice” by Washington, London and Canberra, but in reality is anything but. And what such reckless abandonment of objectivity says about these governments is that they, not Moscow, are callously unconcerned with delivering justice to the families of those who were on-board MH17. The conflict in Ukraine is without a doubt a proxy war between NATO and Russia. 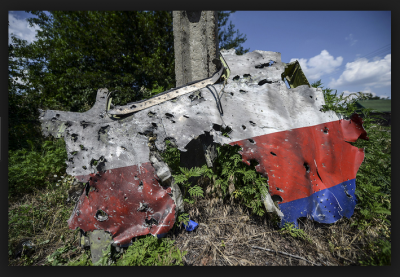 The downing of MH17 has clearly benefited NATO and its immense propaganda machine, but assigning blame is nearly impossible as NATO and its proxies are just as likely to have shot down the doomed airliner as they claim Russia is. That NATO also has both the motivation and precedents of staging atrocities to advance its own agenda, further casts doubt on their “certainty” that Moscow is responsible. Investigations, tribunals, and resolutions that involve nations that may have been involved in the downing of MH17, or who clearly seek to use the disaster to advance their own self-serving agendas defies justice both for the victims of the MH17 disaster and for all future incidents that requires international cooperation to arrive at real justice. As the US and its European allies have done in Iraq, Afghanistan, Libya, Syria and Ukraine, hiding behind ideals like “human rights” and “justice” rather than truly standing for them, MH17 serves as the latest example of how willing the West is to sacrifice both its own credibility and the credibility of the ideals it claims to stand for, simply to advance its agenda against its enemies. Even if the West truly believed Russia was responsible for the MH17 disaster, what would it have stood to lose if it went about investigating the disaster in a truly objective and measured manner? Even for those who believe Russia was responsible, or who fully back NATO, could they honestly say that the West has been truly objective and fair regarding MH17 from the very beginning? Is CNN and the BBC not still to this day intentionally implicating Russia with carefully crafted language to mislead and manipulate readers? Russia, even by the BBC’s own belated admission toward the bottom of their report, seeks an international investigation regarding MH17. Should the West act in a truly objective manner toward such an investigation, they may find future resolutions met with agreement rather than a veto.